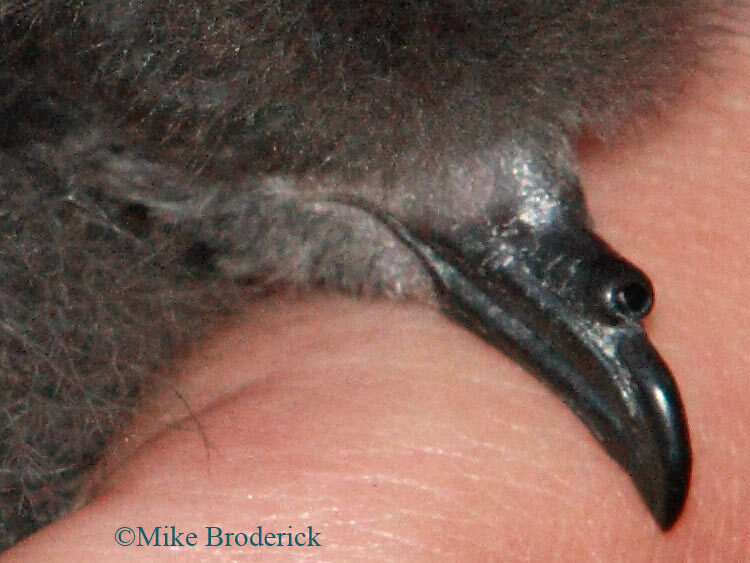 This is a five-week old storm petrel chick (storm petrels are an ocean-living bird that spends time on land only to breed). 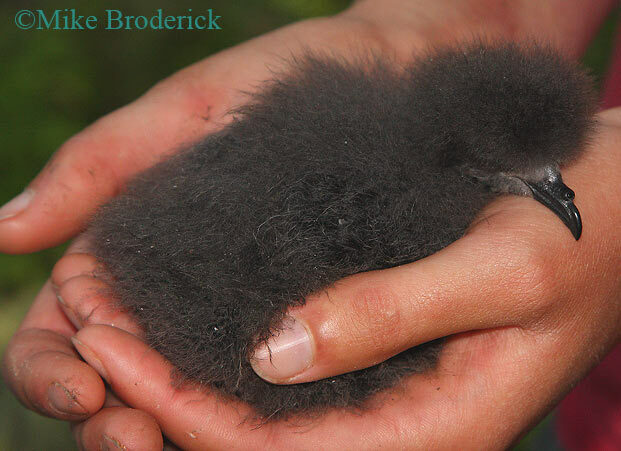 The chicks are left in nests built in burrows each day, while the parents search for food out at sea. I photographed it on Kent Island in the Bay of Fundy last week, when we visited a Bowdoin College research station there. The researchers have about 40 burrows set up so they can easily access the chicks, which they do every day to record weight gain and other vital statistics. This chick was simply identified as a "storm petrel" and I didn't know enough about them to ask for a species, but based on the books I suspect it is Leach's Storm Petrel. Even with the crop to 6", this one strikes me as pushing the forum's limits because of the subject matter -- one each entire cute baby bird. You wouldn't happen to have a nice tight crop of the little tyke's very interesting bill sitting around, would you? Your wish is my command, Sahib! Alas, viewed at 100%, this doesn't impress the jeeberjabbers out of me. Partly from being out of the plane of sharpest focus, and the noise from ISO 800 didn't help much (we were in a shady wooded area, where the parents dig burrows). The only time I got involved in something similar, it was with Manx Shearwaters and at night. Sharp beaks and projectile (very fishy) vomiting were the reception that met us! How interesting! I had thought that lump on the beak was just a lump. But in this much tighter crop it appears to be hollow. Is that an opening into nostrils, or something else? Petrels are part of the Procellariiformes, the tubenosed swimmers. As they spend practically all their lives at sea they have a great problem getting fresh water; so they drink sea water. Not enough fresh water to excrete the salt via the kidneys. They have some sort of salt extracting glands in the head and the tubular nostrils are part of the system for excreting salt. Interesting, many lizards (mostly desert dwellers) have a similar gland. I presume parallel evolution at work.